Even the most powerful men in history love Fido. America’s first families have often included a furry friend. The White House has a long history of presidents and their dogs, and today it’s almost unthinkable for a president to take office without appointing a “First Dog” as well. Here’s a look back at some of the Presidential dogs who have occupied the big office (oval). American first President owned hunting dogs. It is impossible to talk about the famous president in history without mentioning the first president of the United States, George Washington is also known as the father of the American foxhound (although he named them "Virginia Hounds"), because he was the one who first breeds them (from English Foxhounds and French foxhounds). Washington bred and maintains more than 30 Foxhounds. His affection for dogs can be seen in Clare's tale of the Revolutionary War. According to the story, during the Battle of Germantown, US forces were trying to contain Gen. William Howe’s troops who were occupying Philadelphia. At one point, the British General’s terrier dog was found and brought to him. Instead of Washington heeding his troops advised to keep the dog as a sort of victory trophy, which might weaken the British morale. He took the dog back to his tent, fed him, brushed him, and cleaned him, then ordered a ceasefire so the dog could be returned safely to the General. Although Teddy Roosevelt had many dogs, his Boston bull Terrier, named Pete was the most turbulent. Pete received some unnecessary reputation for biting some White House guest, including a police officer, government clerk, and a utility worker. The story has it that Pete even tore the pants off the French ambassador, Jules Jusserand. Harding’s Airedale Terrier (Laddie Boy) was the first presidential dog to be covered by the press regularly with regular mock interviews with the dog being published in newspapers. Laddie Boy accompanies Harding everywhere, from golf games to cabinet meetings (where he had a hand-carved chair aid). The story has it that Harding holds birthday parties for Laddie Boy, inviting all dogs around the neighborhood for dog biscuit cake. After the death of Warren G Hardin, in honor of the former paperboy, a sculpture was made for Laddie Boy. This German shepherd known as King Tut joined the Hoover family while the president was in Belgium before his election. The famous image of Hoover and King Tut was released and sent to America in an attempt to make the stubborn Hoover character friendlier. The picture worked and King Tut became a brilliant guard dog in the White House, keeping an eye on everyone who visited the White House and patrolled the parameter at night. Fala, a Scottish Terrier was perhaps one of the most famous presidential dogs of all time. The dog follows President Roosevelt everywhere and as such, has become part of his presidential image (the dog even has his own press secretary). During the war, Fala was named an honorary Army private for contributing $1 each day of the year to the war effort. The US soldiers even use the "Fala" as a "password" to guard against German soldiers in the possible infiltration of American ranks. Pushinka (Russian name for “fluffy”) one among the President several dogs was famous for being a gift from Soviet leader Nikita Khrushchev. Pushinka was one of the litter puppies of Strelka, one of the first Soviet dogs in space. This renowned Cocker Spaniel belonged to Nixon when he was the vice-presidential candidate for Eisenhower. Although Checkers sadly died before Nixon becomes president, she is renowned for what is recognized as the "Checkers Speech," in which Nixon made an emotional reaction to being accused of having a secret slush fund. Nixon stated that the only political gift he received was Checker dog and his children loved that dog, so he will not give her back, even if it was a crime. Liberty a Golden Retriever was a lovely dog that followed the president to Camp David, around the White House lawns, and was often photographed with him in the Oval Office. One story goes that one night Ford determined to take Liberty out for a short walk on the South Lawn but did not inform secret service first, and so he got locked out of the White House when he tried to come back. Millie an English springer spaniel was best known for becoming the first author-dog in the White House with her book: as dictated to Barbara Bush which sold more than the president’s autobiography. When she was not writing her book, Millie was accompanying the president to some of his important summits and she won the hearts of the world leaders such as Queen Elizabeth and Vladimir Putin. 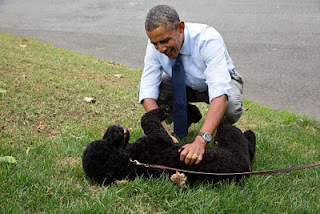 Bo, the Portuguese water dog is hypoallergenic breed selected partially for Malia Obama’s allergies. The first family decided to get a dog was extensively covered by the media, but finally, Bo was accepted as a gift from Senator Kennedy.